Yes, I realize this post is frighteningly long. I apologize, yet I fear it's not the last time I do that. I tend to be wordy - plus I want to make sure I cover everything and am specific! It's all my grad school professors' fault - "Make it detailed enough to be replicable!" 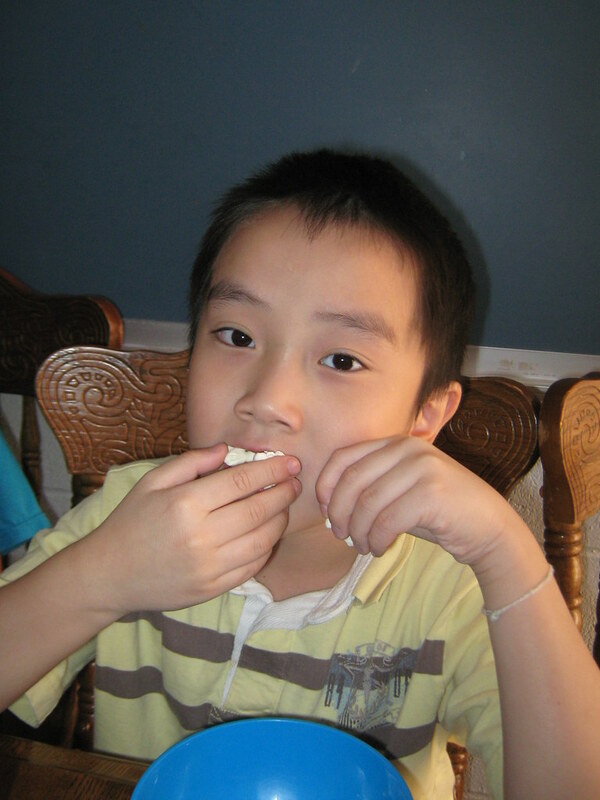 In my class, snack time is not a "break" time. Why not?? One of the hallmark characteristics of autism is difficulty communicating. On the one end of the spectrum are your kids with Asperger's Syndrome who have trouble with pragmatics and with the social aspect of communication but can talk just fine (just ask them about something they're interested in and you'll see!). On the other end are the kids like my students who either don't speak or only say a few words. Many of the kids on this end of the spectrum not only don't speak, but they also don't sign or use any form of communication consistently. You're most likely to elicit communication when you find something they really like and only let them have it if they ask for it (whether they ask by saying "I want it", signing it, handing you a picture of it, pointing to it, or whatever). Problem is, often the child has very limited interests and there may only be a few things that are worth all the effort they would have to put forth to ask for it (and if it's not worth it to them, they aren't going to ask!) and sometimes some of the things that *are* that motivating to them you can't take away (eg. the student my really enjoy flapping their hands, verbally stimming or rocking back and forth - kind of hard to keep their hands/voice/body from them until they ask for it! I suppose you could hold their hands/body still but I have yet to find a way to keep their voices turned off - if you find a way PLEASE let me know!!) :-) And once you take away those, you may be left with a favorite toy or two and favorite foods. This makes playtime and snack/mealtime excellent times for working on communication!! But for this post I will focus on snack time. Scheduling snacktime: In my classroom, from 9:30-10:15, we have small group rotations. At 9:30, Mr. Anglin (one of my amazing paraprofessionals) and 3 students go to the sensory room to work. I work with 3 students in the classroom. Mrs. Pfefferle (my other amazing paraprofessional) and 3 students have snack at the kitchen table. At 9:45 the kids rotate so my 3 go with Mr. Anglin to sensory, his 3 go to snack with Mrs. Pfefferle and her 3 come to me. At 10:00 they rotate again. I do this because I have 9 kids in my class and, as you'll see, our snacktime "routine" isn't exactly simple. We're instructing - which means the students are working on something they're not familiar with or proficient at. That neccessarily means that it's going to take time and effort on the students' and our parts. A group of 3 kids to one adult is, in my opinion, a large enough - if not too large - group for this level. Ideally each student would have an adult to work 1:1 with them, but we get free and appropriate, not ideal. All nine at one time, even with all three adults, is just too much. Too many people talking at once, too distracting for the kids (one para is trying to get one child to say one thing, another trying to get another to say something else, how can I expect the child I'm working with to be able to focus on what I want her to say? ), and logistically difficult because all three adults are trying to move around the table back and forth to the pantry/fridge/choice board/etc. and it's not that big of a kitchen! 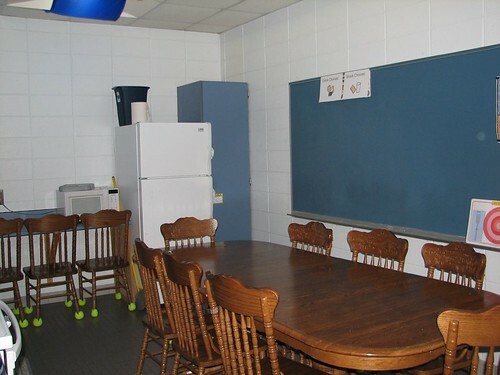 Setting the stage: For some reason, there is a magnetic chalkboard hanging in the kitchen in my classroom. I don't understand why, but I take advantage. At the beginning of the year, I send home a note asking parents what snacks their child really likes. I print boardmaker pictures of these food items (and the drinks we have - juices, milk, water, koolaid) and make sure I keep them stocked in our pantry/fridge. I then use my xyron laminator with magnetic laminating film to laminate and magnetize the pictures and hang them on the chalkboard. I printed a large "snack" and "drink" sign to hide the choices. This way the pictures are conveniently stored in the kitchen where we need them. They don't get gross yucky (have you ever seen velcro dots on the back of a picture that's been held by someone who just ate cheezits or peanutbutter? Food just becomes embedded in the fuzz) and if they do we can wipe them off (have you ever tried to clean cheezit out of velcro? Even with a stick pin it's impossible). 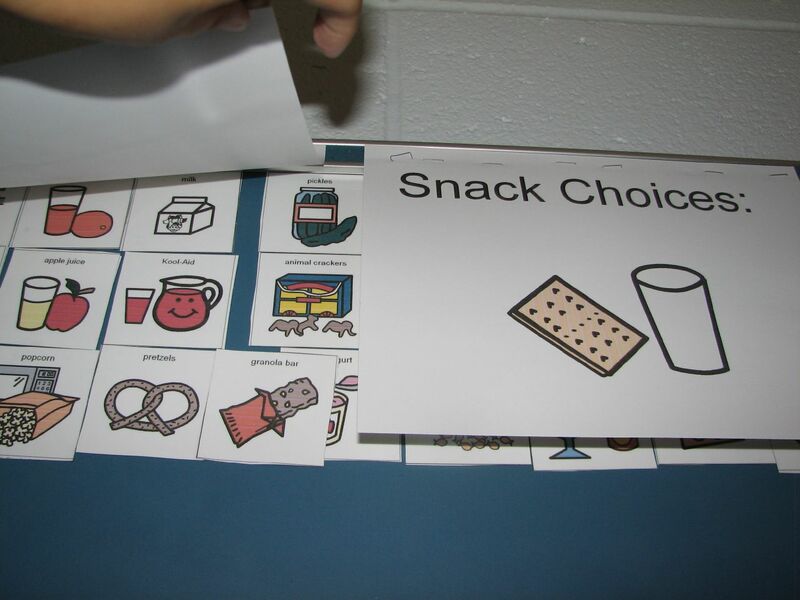 We use a small magnetic board as a choice board, putting just the snack items that are choices that day (anywhere from 2 to 8 choices, depending on the child's skill level at choosing from an array). For students who don't comprehend line drawings yet, we use photos of the actual food/drink, and for students at an object-level, we attach a piece of the food (cereal, small cookies, crackers, pretzels) or part of the packaging (poptart wrapper, the foil top of a pudding cup, juice box, koolaid packet) or a plastic version (apple, glass of milk) to the picture. How do I know how many choices to give? or whether to use drawings, photos, or objects? Glad you asked!! I determine this during discrete trial training. Hold up a juice box and a container of milk and ask the child "Which one is juice?" or "Which one is milk?" - if they can do that consistently, then you know they can identify juice and milk. Now do the same with photos. 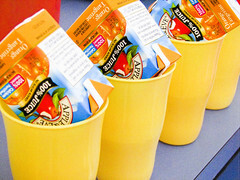 Then with photos of a different juice box/milk container. Then with line drawings (boardmaker pictures or other pictures). Do this with other drinks and food items. Only expect a child to communicate when you are sure that they know what they are communicating!! If they don't know that the sweet stuff they like to drink is represented by the boardmaker picture of the pitcher of red stuff with a smiley face, they won't be likely to ask you for koolaid using that picture! To determine how many choices, take something that you know the child can identify - either objects, photos or pictures. Put out two different things and ask for one (which one is the pretzel?). If they can do that, then put out three choices. If they can do three, try four. Keep going until you get to eight choices (sometimes I go as high as ten). It's not often that you have to choose between more than 10 things - even kids' menus at restaurants don't have that many choices. Whatever amount the child is consistently able to discrimate from is the number of choices I give them. This way they have more variety but I know they are still able to actually tell me what they want instead of just randomly choosing something because they're overwhelmed by all the choices. Keep in mind – if a student cannot discriminate between two objects yet (the juice box and the glass of milk, or the pretzel and the cereal) then we need to target that for instruction! I won't get into that now, but if you need help with that and can't wait until I blog about it J, maybe looking at this example of a discrete trial training session. A student who is just beginning may only get one choice – if they are not yet able to discriminate between two things, I may just pick something I know they like (I don't like to do this because I really like to give them choices – they have such little control over their life just by nature of being a child, then less control due to their inability to communicate, I like to give choices whenever I can to give them some control!) and work on saying/signing "more" (give them just a little bit and they have to ask for more several times to get a little more each time). Some students will simply verbally label the snack that they want – by saying or signing, depending on their IEP goal, either "cookie", "cookie, please", or "I want a cookie, please", etc.. Which of these is their goal, of course, depends on their present level! If they consistently label the item (cookie), then their goal is to add the please… their next goal is to add want, then I want, then putting in the a/the/some – you get the idea J Always pushing them to that next level. Just look at them with our eyebrows raised, waiting for them to tell us what the picture is. Ask "What do you want?" again. Ask "What do you want?" again then provide a carrier phrase "I want …" and wait for them to fill in the blank. For some students the picture exchange is their goal – if they remove the picture and give it to us, then we will respond with "You want a cookie!" to let them know that we understand their choice. For still other students, we are trying to get them to spontaneously request items, either with the objects present or not, without being asked "What do you want?" (sound like an ABLLS-R goal?) In that case, we either have the choice board visible and simply say "Oh, hi Ashley!" and wait for them to ask for something. If they ask for something we don't have available that day, we will then say "Oh! I'm sorry, we're all out of goldfish crackers – here's what we have today" and show them the choice board, then wait for them to ask for something else. After everyone has a snack (again, Mrs. Pfefferle is only working with 3 kids at a time, so it only takes a few minutes to get through everyone), then we get to drinks. For some kids, the procedure is the same as to get food. For others, we work on different goals. For the students working on asking for help, we may give them a milk carton that they can't open, or put a really big, full pitcher of juice in front of them that they can't pour. For students working on asking for specific actions, we may just give them a cup and stand there holding the pitcher until they ask us to "pour, please". Some students are working on requesting missing items. So we give them a cup with nothing in it, or a juice box without a straw. Or we may just "forget" to give them a drink at all so that they have to speak up and ask for it. So while in many general education classrooms, snack time is a quick break, or even a part of recess, in Mrs. Mays's class snack time is just another academic segment! Nothing's free from this evil teacher, you have to work for everything. But it's only because I love you! Oh and did I mention that we give really small portions, so that you have to ask for more? Or that we may not give you a spoon for your pudding unless you ask for it? And even then, we may give you a giant serving spoon that won't fit into your pudding cup, just so you have to tell us it's too big! And guess what – you have to wash your own plate and cup when you're done! 3 Responses to "Snack Time"
YOU HAVE A KITCHEN IN YOUR CLASSROOM???? Wow. I really am enjoying your blog and getting some good ideas. I have been teaching students with autism for 4 years, but have reached a point where I need some inspiration. I just started my own blog, too, I thought I could try to do what you are doing so well, talk about what I do and maybe help new teachers. It sounds like you have a great school situation. Sadly for me and my students, we are 16 kids crammed into a half classroom with 6 adults. Yikes! So you can imagine my jealously of your kitchen area. I won't even start on your "sensory are." Lucky kids. Thank you! I am an SLP and I "played" with snck time last year with my classroom, it worked very well. I am looking to run our sessions more smoothly and effectively. Thank you thank you thank you. Keep it up...While it seems elementary to you, but the info. is reinforcing and helps.